•	Starts and drives well. I think that most people reading this will realise that it is an old and well used vehicle that will need a commitment to keep it going. My commitment has been to pay quite a lot out over the years for servicing and maintenance and to crawl round it once a month in winter with a garden sprayer full of duckoil. If you are interested, please come and have a look. There is much less than usual. The chassis has had two patches (2010 and 2012) and part of an outrigger rebuilt in 2016. I have filled the outer front wings a bit over the last few years - they are ok functionally, but if I was keeping it and wanted it to stay looking good, they would be the next project. All the work has been carried out professionally, most of it by the same technician who also serviced it for three years before I bought it. 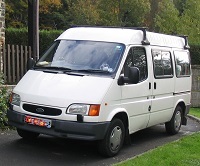 1998 Ford Transit Minibus 200,000 miles and counting owned since 2003.